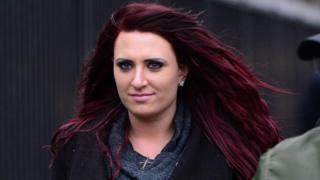 The judge, when convicting Fransen, of Moat Avenue in Donaghadee, County Down, described her words as "a general, vehement attack against a religious group". She was told to return to Belfast Magistrates' Court for sentencing in May. All four defendants were on trial over speeches given during the 'Northern Ireland Against Terrorism' event two years ago. During the trial, defence lawyers argued each of the accused were entitled to freedom of expression no matter how offensive their speeches may be. The court heard that Fransen told those gathered at the rally that there was no moderate version of Islam and that: "These people are baying for our blood." She added: "Islam says every single one of you wonderful people here today deserves to be killed." Those attending the rally were then told it was time for the world to come together against "the one common enemy". The judge told the court: "I'm satisfied these words were intended to stir up hatred and arouse fear." On that occasion, the court heard that Fransen declared the "Islamification" of Britain will lead to similar walls to separate the two sides. She claimed the country was "descending into civil war" and said it was time to "rise up against the biggest threat against the entire world". Confirming a conviction for that episode, the judge said: "I'm satisfied the words were menacing in nature." Golding, of Beeches Close in Anerley, London, allegedly referred to a mosque in Newtownards as part of claims about Islam's colonisation. In his speech, he said: "We have got a problem with one religion and one religion only, that is Islam." The 56-year-old was said to have warned about "a wolf coming down the track". He said some of their speeches were "ugly" but had not crossed the line into being illegal.